Like the previous posts, I'm going to end this week's with a visual aid as well. This was taken yesterday as I was driving (Yes I was multitasking but shhhh). 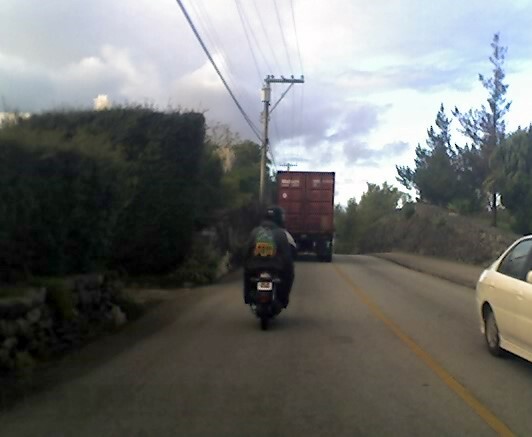 Riding up ahead of me were a couple of guys on their bike. The passenger had a child's backpack on his person. He's obviously not ashamed to carry it in lieu of an adult one. I wonder what he had stored in it. I don't know where else you'd see this. I mean it's a common sight here in Bermuda but there's always a kid present somewhere in the vicinity of the kid backpack. But not here! Really, how many other guys would be man enough to don on a kid's backpack minus the kid? Definitely not anywhere else! In a world where, especially in North America, being politically correct is checked at every turn, there are places where this is not so much of a rule to abide by. In North America, the words 'persons of X origin' is not only becoming commonplace, it's also deemed as the appropriate term to use. But isn't it exhaustive, at times to try and remember the right vernacular? Why can't we just say Black, Brown, Oriental or White instead of African, South Asian, Asian or Caucasian thereby worrying about offending someone? When did things become so black and white? Why is it acceptable for a person of colour to use the politically incorrect term, but a serious faux pas for a White person to use anything but? When did things become so grey? As a minority, a person of colour, I have no problem using the 'politically incorrect' word. No problem at all. Perhaps it's because of my minority status, that I can get away with it. And it's true. Hey, you can call me brown. I won't be offended. Heck, to make things easier, I use the word to describe myself. Most times I no longer use the word Indian in North America, because some will stupidly ask me, 'Native Indian'? Well no, because then I would have flat out said 'Native', right? Oh and a heads up to the family & friends back on the other side of the world - we 'Indians' in North America are referred to as East Indian or South Asian, not Asian - that's for the Oriental folk and not just Indian, because there are present a lot of West Indians. And as I've said earlier, it's very clear cut in North America. In Bermuda, no one's afraid to use the word 'black'. Not even the white folk. You can forget about being politically correct and perhaps there's a reason. Unlike in America where the word African American is used, using the word African in Bermuda may cause some confusion due to the presence of African expats here on the island. Also, using persons of African origin can become tedious to say, just as persons of any other origin. Over here it's, Black, White or Portuguese (a post for another day-I promise). Or if you really want to get down to it, it's either local or expat (wink wink). Getting back to and when talking about colour, it's refreshing to just get down to the basics. So, what brought this post on? 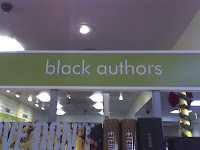 While at a book store a few weeks earlier, I came across this sign. Now if this were in North America, the sign would read African/ American or African authors. But here it is... They're saying it loud & proud. You know what though - all this talk of colour is going to be moot in a few hundred years. According to Russell Peters, we're all going to be BEIGE. Salmon is hailed as 'the' fish to incorporate in one's diet. Loaded with Omega-3 fatty acids, it is literally food for the brain, among its many other dietary contributions. A couple of interesting facts about salmon: they are born as fresh water fish & migrate to the ocean, spending up to five years to reach sexual maturity after which they return back to fresh waters to spawn. It's said that salmon return back to the very place they were spawned. The unfortunate thing about this species is that most die soon after spawning, some within a few days, others within a few weeks. Such a waste, eh? What do we not have in Bermuda, but plenty of in Canada? No it's not snow, although it does 'lurk' in the backyard, the front yard or anything with a yard. It's something I've never had to worry about growing up in Bombay or Dubai. Something that we had only heard of, like a 'suburban' myth! Run as fast as you can away from it, we were told. You don't want to be anywhere near it when it unleashes its defence mechanism, and that was enough to make us fearful, if we ever found ourselves in its path. We knew what it looked like. Plus there were cartoon characters based on this animal. But cartoons stand for nothing in the real world and Pepé Le Pew is no exception. Yes, we're talking about the dreaded skunks, and while skunks may look cute (sort of), they are anything but. Beware of the spray, run away. Skunks are a common prowler in our Toronto suburban backyard. I've seen them many a time in our front yard too and have had to wait until it's made its exit. Sometimes for upto a minute. Shooing it does not work and I've never stuck around long enough to find out what would. One of Toronto friends once told me that he got away from a skunk Mission Impossible style, barely missing the spray, and then running for his life. I couldn't help but laugh while he reenacted his moves. There's no way to scare a skunk. So, what if you do get sprayed by one, accidentally? How do you rid yourself of that dreaded smell? Apparently, tomato juice, and I don't know who discovered that and how, but tomato juice is the only remedy. You don't drink it but rather bathe in it. Many times. Fill up that tub & get ready for rounds two, three and possibly four. Eck! Yesterday another Toronto friend of mine said her cat got sprayed by a skunk. Poor Norman! (Yes, the cat's named Norman). HEY! A skunk and a cat? Sound familiar? This is exactly like Pepé Le Pew and his attempted daliances with a cat mistaken for a skunk, except the roles are reversed (maybe! we don't know if the skunk was female). One of the comments she did received was that maybe Norman tried to 'hit' on the skunk. I did ask her if she tried tomato juice on Norman & if it actually worked on animals, like it supposedly does on humans. She replied saying she used pasta sauce instead...and no it didn't work! Course not. Poor poor Norman! If the skunk makes an appearance again, they may just have to name it Pepé. Do you ever get the feeling that you've been exposed to something new this year that while has been around before, just hadn't caught your attention last year. Happens to me every year. Mostly it's to do with spring. Every year I will notice something different foliage wise - a new flower or a new plant that has been staring at me right in the face, but I've just been too blind to notice the previous year. Looks like this year's theme is festivals/ holidays. First it started out with Diwali, which was celebrated with much fanfare all over the world by people of all religions, more so than the years before. For the first time, I was privy to pictures, emails, wishes - ones that had missed me completely last year. Is it that I have gotten in touch with more relatives residing all over via a family tree project, that have been sending me Diwali wishes, even though they're not Hindu. (Not surprising, since Indians have long been celebrating each others' festivals regardless of religious affiliation). Or is it that people the world over are getting into the spirit of multiculturalism, which is such a nice thing to see happening. We here in Bermuda are often asked if Thanksgiving is celebrated at all - Canadian (celebrated in October) or American (celebrated in November). We always answer with a resounding NO! It's not celebrated by the locals, just the expats, depending on their nationality. Or at least that's what I thought. Apparently, American Thanksgiving is celebrated by many Bermudians - turkey, stuffing, dressing, the whole nine. Even the tradition of Black Friday (the day after Thanksgiving, where rock bottom prices hit & shopping records are in the making), is a fever that has caught on in Bermuda. (By the way, can I just say that I am horrified that they call it Black Friday! Borderline blasphemy). Maybe having a car exposes us to a little of Bermuda's what happenings via the local radio stations which we seem to have on most time, despite the car being equipped with an MP3 player. Maybe this year we will scope out the Black Friday sales, just to see what Bermuda has to offer (remember people, it's tax free). Anyway, Thanksgiving may not be a day off in Bermuda but it will definitely be celebrated. So what's next for me? Christmas? Hanukkah? Kwanzaa? Riding a scooter/moped/bike here is the fastest, most fuel efficient way of getting around the island, especially during rush hour. Faster but not necessarily safer. 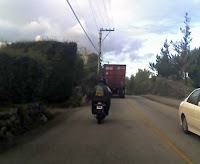 There are many that are killed each year from motorcycle accidents & almost always speed is the underlying factor. A balancing act involving transporting things to and fro factor in at other times. It's always amazing how much you can fit in/on a bike. Groceries can be packed in every nook & cranny, depending on how creative you are. We've managed to bring home many an item of varying sizes that one may think unmanageable on a bike. However, depending on what the item is, it might not always retain its shape by the times its made it home. This past Monday was Hubby's birthday and I set out to surprise him with a cake for later on in the evening. As I brought the cake home, I was taken back to our first year here in Bermuda. We'd invited a few friends over for dinner for Hubby's birthday that year. Since no birthday dinner is complete without some birthday cake, I had to go into town with Hubby to get it as I'm not one to get on a bike and drive around town (In fact I still refuse to do it). I was hoping the cake would remain intact everytime we drove over uneven spots on the road. Upon our arrival home, we set the cake on the kitchen counter. I was pleased that see that it hadn't crumbled and that's when I noticed it was a little lopsided! From the bike ride home! Like the leaning tower of Pisa! Of course, I lacked the moxie to try and get it back into shape. It brought out some good laughs during dinner. In fact, it was barely noticeable in the pictures. Ok maybe a little! Still tasted delicious, though. This year I managed just fine, now that we have a car and I of course, have no problems driving a car. This year's cake made it home just fine. After all, a car is no bike. No more lopsided birthday cakes in this house! Bumper sticker seen on a car in Bermuda: A day without sunshine is like....night! How especially true for today! If you were in India, you'd be celebrating Children's Day today. It's a day that's just that, a celebration of children. There are many other countries that celebrate Children's Day on various different dates, but in India, since 1959, it's been celebrated on the birthday of India's first Prime Minister - Jawaharlal Nehru (also the father of Indira Gandhi). This day was specifically changed & chosen to fall on his birthday, because of his well known love for children. So, what does this day mean for children in India? Well, it's a fun day where kids all over the country, who normally wear uniforms on every other day, get to don on their nicest (non uniformed) clothes for the school day. When we were kids, we'd call this 'coloured clothes' - a treat, only otherwise reserved for one's birthday! As I remember it, every year on Children's Day, we came into school in our 'coloured clothes' like it was a regular day , except there were no classes, no books, no tests! What we did have was a giant jolly big party. There were candies & chocolates, songs & dances, games & shows - just a whole day of fun. A day we always looked forward to. America has been celebrating Children's Day since its inception by then President Clinton in year 2000. Unfortunately, neither Canada nor Bermuda celebrates this day & I am surprised. I think it should. It would be worthwhile to celebrate such a day as this. With the growing number of child abuse cases every year everywhere, a day dedicated to children, is a day that can make a difference to the very same children who are the innocent victims of today's dysfunctional world. Wouldn't it be reassuring to your child, to any child that they are being celebrated just for who they are & what they are. It's a great way to build self esteem, pride & create a common thread among children, regardless of colour or race. So, to all the children in the world over, HAPPY CHILDREN'S DAY! I hope you're having as much fun as you possibly can. Here in Bermuda, Remembrance Day is a day of observance & a statutory holiday. Since it falls on Sunday this year, we have today (Monday) off to make up for it. Now I've mentioned before how the newspaper is not in production during statutory holidays. Well, last night I found out, the local news isn't either. So, no newspaper & no nightly news? How on earth would we know what's afoot on Sunday? Well surprisingly, at least the newspaper's website is up & running, with breaking news that Bermuda has lost the cricket match against Dubai, being played in UAE's capital - Abu Dhabi. I had no idea Dubai's team or more precisely UAE's team was that good. They beat Bermuda! Well, in the first place, I had no idea there was a match on. What am I saying??? It's cricket! There's always a match being played somewhere! I'm sure my father's watched it though & had I spoken to him last night or in the wee hours of the morning, I would have heard all about it. Anyway, enough about cricket. Getting back to the lack of newspapers & newscast coverage on statutory holidays. The rest of the world should take a 'page' from Bermuda's policy of statutory holidays. This is how stat holidays should be observed, dontcha think? The biggest change one experiences after moving to the island is that life is at a slower pace than before. No longer having to suffer through one hour (one way) commute on the subway but now breezing through a fifteen minute morning commute is just a breath of fresh air. And it really makes all the difference. Instead of catching a few winks on the subway, we have the comfort of our bed to indulge in that extra half hour of sleep in the morning, which would be welcomed by anyone. Suddenly, there's more time for everything else too. Dinner is ready earlier and there's even time to hit the beach, if one's in the mood. Sure we give up a few things when we assimilate ourselves into the island lifestyle, but there's things we gain as well. There's always a balance, if you know where to look for it. I've heard that some people are allergic to bee stings. Now, I've never been stung by a bee (yet) & have no idea what it would feel like or if I would be allergic. You never really know until you've received your first sting. I may have come close to it though. I remember a particular incident with bees while I was in my teens, living in Dubai. Our third & final residence was a third floor apartment with an extra long balcony, that probably stretched about 40 feet in length. A few years into our residence, we started to notice bees hovering outside our windows. About one or two everyday, but their appearances were consistent. We could not explain it. Until that is, we (my father & I) decided to spring clean the corner of our balcony. Stacked behind an old bicycle, some boxes (and other things I cannot seem to recall), we were amazed to find a bee hive. And now we knew why we alone were privy to the appearance of bees. Unfortunately, we had to get rid of the bees, by a process of which I will not & cannot go into. I felt guilty enough getting rid of the bees. My father was adamant we get rid of them now that there would be nothing for them to hide behind. In the moments to follow, I was an accessory to murder, more like an annihilation. You may think I'm being a tad dramatic, but you'll see. To make matters worse, once we got rid of those bees, we were left with their life's work - HONEY! There are a couple of interesting facts about honey. The first: babies under the age of two should NOT be given honey (among strawberries & peanut butter), due to its allergy causing factor. The second: its lack of an expiration date. That's right. If stored correctly, honey does not spoil & can last forever. I recently read that a discovery of an Egyptian tomb in a pyramid, also yielded within the tomb, a container of honey. Pyramids are known to be thousands of years old & the honey found in that pyramid was no exception. Of course, it was put to the test & amazingly, it tasted like a batch of honey that was extracted yesterday. A two thousand year old jar of honey??? You need a moment to digest that fact? Go ahead. I sure did. Too often we look at buzzing bees with annoyance. Much too ready to kill them off before there's a chance they'd sting someone, not much thought is given to their importance & how vital they are. Of course, you're thinking the only thing they are good for is honey. That's what I thought too, until I watched a shot local documentary last night, on a new Bermudian channel - CITV (I promise to do a post on this at a late date). However, in the meantime, in short, CITV provides information on Bermuda & anything Bermudian. Mini documentaries are just one part of it. Last night it had an excerpt about Bermuda's bees, its beekeeper & the island's honey production. More importantly, it sadly stated that this year's honey production (harvested twice a year) was at its all time low. Add to that, there was also the finding that something is killing off bees & this something is not limited just to Bermuda. I had heard earlier on in the year that bees in other parts of the world are also dwindling in numbers, dropping like flies. Scientists are not sure why. The documentary further went on to say that bees are vital to our survival. Most of our produce (vegetables & fruits) is only possible with the presence of bees & the byproduct of their honey production which is pollination. If the bees were to disappear, we can kiss our vegetables, fruits & flowers goodbye. For first come the flowers & then the fruit & the completion of a flower's life cycle is only possible with pollination. Can you imagine a world without flowers, fruits and/ or vegetables? What on earth would we do? How on earth would the Vegans survive? Perhaps, honey may be the only thing we may have left. And thankfully, it does not expire. How ironic! I can tell you this. I feel terribly guilty, guilty for killing those bees, those years ago. The neglect of our planet, our wanton ways, our misuse of earth's precious resources, our pollution, is all finally, finally catching up with us. It's horrifying to think that the earth as we know it may not be around in about 50 years, at the rate we're going. Heck, I'd settle for 20 years right about now. The bees are just one chapter of this ongoing ecological damage, damage that may be irreversible. Who knows what's next? Maybe we should start with the bees. SAVE THE BEES, SAVE THE WORLD (Yes, I watch Heroes, thank you). So, the next time you see a bee, what are you going to do? Please for the love of... don't kill it. There will be one less. Dangerously one less. The picture in this post is of Bermuda bees, hard at work (one on a flowering Cacti, the other on a Banana tree flower). How oh, how could we have been so careless?! And what are we doing specifically that's killing off them bees? Last year on this day, Hubby & I were getting ready to watch V for Vendetta, a movie incidentally about the 5th of November. If you haven't watched it, I suggest today's as good a day as any. It's one of my favourite movies & on this particular day last year, it was all a coincidence really. We had some idea of what it was about but not the fact that it was about Guy Fawkes Day. I remember reading about Guy Fawkes as a child, fascinated with the fact that they'd in indulge a massive bonfire & burn a Guy Fawkes dummy. It reminded me of something similar, though set on a different day! Growing up in Bombay, I lived in a neighbourhood of nine apartment buildings, with an apparent baby boom in the works during those days (must have been at least a 100 of us children at the time). And so because there were so many of us kids of varying ages, holidays & festivals of all religions were celebrated communally with much much fanfare. In India there are many festivals, as the government recognises quite a few religions which results in an abundance of public holidays. One of my favourites was New Years' Eve, where we children (under strict supervision) were able to partake in the largest bonfire every year & set atop it Old Father Time in the form of a dummy. Now I never knew where the dummies came from but I assume someone in the 'colony' would be kind enough to make it for us year after year. Old Father Time would crumple up in a blaze right before our very eyes, signalling in the New Year. The night also concluded with each of us receiving a party bag, filled with candies & mini toys. Ahh the memories! And while we'd get to stand around & watch the wood snap crackle & pop, we were hypnotised, for it was not often would we get to play with fire (literally speaking). Besides, what child can resist the lure of a flame. I know Hubby can relate - as a kid, he once set his carpet on fire. It was a small fire & easily doused when he realised what he'd done. However, explaining the burnt hole in the carpet to his parents when they got home was no easy feat. Kids & fire, especially bonfires, are like a moths to a flame. And so! To my AN Colony friends...do ye remember those days? Thanks to the older guys for making it fun...You know who you are! Guy Fawkes Day is still celebrated here in Bermuda. Not surprising, considering it's still a British Territory. I'm sure for many Bermudians, it's a chance to relive childhood memories & also to be able to pass the torch, so to speak, to their children. I'm sure I will get a whiff of one or two bonfires around the neighbourhood & I hope to scout the area for some photographic opportunities. And last but not least, Guy Fawkes Day in our house is also known as Dad's birthday! My dad, of course! HAPPY BIRTHDAY, DAD! Hope it's a fiery one! It's still windy here & Tropical Storm Noel has been upgraded to a Hurricane BUT, its path has shifted more towards the east. That can only mean that it's farther from Bermuda & closer to the American East Coast. What can I say? The Gulf Stream saves Bermuda, again. A note to my American & Canadian friends, BRACE YOURSELF! On another note, I love how the Bermuda local nightly news (obviously a repeat of the evening news) still slates Noel as a Tropical Storm. Understandably. I had to tune into the American news (more precisely Boston's Channel 7) to hear the update on Noel now wreaking havoc as a hurricane. The wind is blustery & the windows or in our case, the sliding doors have been rattling since last night. It's a sound we haven't quite heard all through the summer months, until now. Time to put everything away. 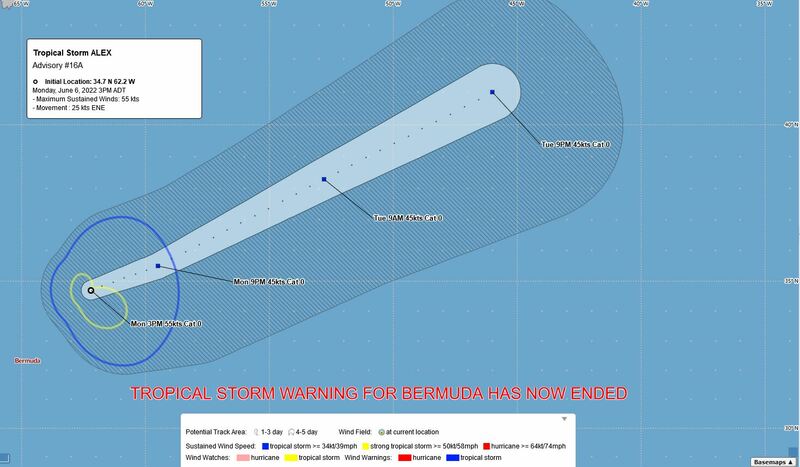 Just as Bermuda's hurricane season comes to a close with no reportings for this year, we now have to prepare for our first, Tropical Storm Noel, expected to reach its closest point of approach by Saturday. Luckily all we're going to get are the remnants of the storm, but that means we're still going to be hit with a lot of rain, gale force winds, rough waves, that sort of thing. Grrr! This weekend is definitely shot to hell. ~ Canadian Expat in Cayman. ~ Places lived: Bombay, Dubai, Toronto, Bermuda & now the Cayman Islands.